Human Flag-tagged TLR3 stably expressed by Ba/F3 cells. Our Abpromise guarantee covers the use of ab12085 in the following tested applications. Inhibition Assay Use at an assay dependent concentration. Use ligand poly(I):poly(C). IP Use at an assay dependent concentration. See paper by Matsumoto et al, 2003. See paper by Matsumoto et al, 2003. Key component of innate and adaptive immunity. TLRs (Toll-like receptors) control host immune response against pathogens through recognition of molecular patterns specific of microorganisms. TLR3 is a nucleotide-sensing TLR which is activated by double-stranded RNA, a sign of viral infection. Acts via MYD88 and TRAF6, leading to NF-kappa-B activation, cytokine secretion and the inflammatory response. Expressed at high level in placenta and pancreas. Also detected in CD11c+ immature dendritic cells. Only expressed in dendritic cells and not in other leukocytes, including monocyte precursors. TLR3 is the TLR that is expressed most strongly in the brain, especially in astrocytes, glia, and neurons. Defects in TLR3 are associated with herpes simplex encephalitis type 2 (HSE2) [MIM:613002]. HSE is a rare complication of human herpesvirus 1 (HHV-1) infection, occurring in only a small minority of HHV-1 infected individuals. HSE is characterized by hemorrhagic necrosis of parts of the temporal and frontal lobes. Onset is over several days and involves fever, headache, seizures, stupor, and often coma, frequently with a fatal outcome. Note=TLR3 mutations predispose otherwise healthy individuals to isolated herpes simplex encephalitis through a mechanism that involves impaired IFNs production and reduced immune defense against viral infection in the central nervous system. ds-RNA binding is mediated by LRR 1 to 3, and LRR 17 to 18. Heavily N-glycosylated, except on that part of the surface of the ectodomain that is involved in ligand binding. Endoplasmic reticulum membrane. Endosome membrane. Flow cytometric detection of human TLR3 on THP-1 cells. Red line represents the isotype control and the black line represents ab12085 at 10 μg/ml. Publishing research using ab12085? Please let us know so that we can cite the reference in this datasheet. 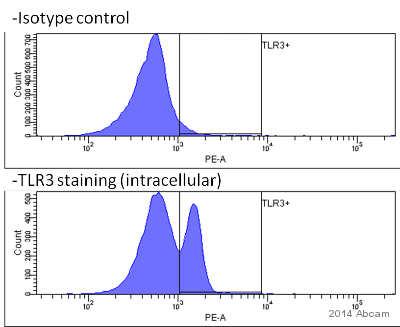 Have you tested the endotoxin level in your anti-TLR3 antibody solution, both biotinylated and unbiotinylated? I heard back from our lab that the most recent lot of ab12085 had an endotoxin level of 0.02EU/ml. The ab17264 has not been tested for endotoxin. I need to know the moleculas mass/ weight of the anti TLR3 antibody Ab 12085. This is a monoclonal antobody from mouse of IgG1 subtype. In general the molecular mass of IgG1 molecule is about 146kDa, but I guess can vary. Do you know the molecular mass of the IgG1 in Ab 12085? I can confirm that IgG1 has a mass of ca 150kDa. This should not change very much between different mouse IgG1 (unconjugated) antibodies. ab12085 has not been specifically tested for its molecular weight and therefore we assume that it is in line with being a mouse IgG1 and therefore ca 150kDa. If you are looking at a gel of this product, I would like to note that it also contains BSA. I am interested in Cat NO: Anti-TLR3 antibody [TLR3.7] (ab12085). Amongst their applications, “Inhibition Assay” is mentioned, how it has been evaluated? Thank you. Monoclonal antibody TLR3.7 inhibits dsRNA-induces IFN-beta production. 7.5*10E4 MRC5 cells were pre-treated with 10-20 µg/ml for 1-24h at 37°C. I want to ask a question about your product Anti-TLR3 antibody [TLR3.7] (ab12085). In the direction of it on your website say that it can be used in an Inhibition Assay. I want to ask does it mean it can be used as an inhibitor to block the function of TLR3. Hope to get your answer soon! Matsumoto, M et al; Establishment of a monoclonal antibody against human Toll-like receptor 3 that blocks double-stranded RNA-mediated signalling. Biochem Biophys Res Commun 2002, 293: 1364. Thank you for reading my letter. I have done several times of ELISA use the cAMP kit (ab65355). I follow the protocol strictly and make sure all reagent kept in proper temperature, however, the result is not so good, the standard curve is not linear but power. I tried 3 times and got same result. I don't know why. Could you give me some advice? Thank you very much. Thank you for contacting us regarding ab65355, cAMP Direct Immunoassay kit. As requested I have created a credit note for the original purchase. Your credit note ID is . I am sorry that this antibody did not perform as stated on the datasheet. I have asked our accounting department to issue a credit note for you, which can be redeemed against the invoice of a future order by passing it on to your purchasing department. To avoid confusion, please ensure your accounts department is aware of how the credit note is being used. If you have questions on how to use the credit note, please contact our accounting department. If payment has already been made on the original order and you wish to receive a refund, please ask your purchasing department to contact our accounting department so that we may gather the correct information needed for the refund. To avoid confusion, please ensure your accounts department is aware of how the credit note is being used. Our accounting department can be contacted by email at us.credits@abcam.com or by telephone using the information at the Contact Us link in the top right corner of our website. Please refer to the credit note ID in any correspondence with our accounting department. The credit note ID is for your reference only and does not automatically guarantee the credit. I hope this experience will not prevent you from purchasing other products from us in the future. Our Scientific Support team is always at your service, should you require further expert advice. Thank you for contacting us. Unfortunately Anti-TLR3 antibody [TLR3.7] (ab12085) has not been tested for neutralising activity in rat. More information on the antibodies functional activity can be found from the following reference: Matsumoto M et al. Establishment of a monoclonal antibody against human Toll-like receptor 3 that blocks double-stranded RNA-mediated signaling. Biochem Biophys Res Commun 293:1364-9 (2002). PubMed: 12054664 The antibody is known to bind the extracellular domain of TRL3. As this antibody is directed against human TRL3 the homology of this region with that of Rat needs to be taken into consideration when predicting if the antibody is likely to bind the rat protein. Through sequence comparison these two regions share 78% homology. We usually predict homologies of 85% and above to react. I can therefore not recommend using this antibody with rat samples. We only have two antibodies, ab62566 and ab117353 which have been used with rat protein but neither has been tested for their neutralising behaviour. I'm sorry I could not be of more help. If you need any further information please do not hesitate to ask. Please send the reference describing the inhibition assay. Thank you for contacting us. The following reference describes the development of the TLR3.7 clone and its use in an inhibition assay: Matsumoto, M et al; Establishment of a monoclonal antibody against human Toll-like receptor 3 that blocks double-stranded RNA-mediated signalling. Biochem Biophys Res Commun 2002, 293: 1364. PMID:12054664 I hope this information is helpful to you. Please do not hesitate to contact us if you need any more advice or information. BATCH NUMBER -- NOT SPECIFIED -- ORDER NUMBER 113270 DESCRIPTION OF THE PROBLEM Wrong band size. Predicted, expected in data sheet and seen in literature is 100 KDa approx, but this Ab gives a very strong band at 70 KDa in our hands SAMPLE Rat NK cell line, rat primary NK cells, mouse spleen (whole cell/tissue lysates) PRIMARY ANTIBODY ab12085, abcam, 1 hr at RT DETECTION METHOD ECL plus ANTIBODY STORAGE CONDITIONS 4? C SAMPLE PREPARATION cells: directly lysed in laemmli SDS buffer and heated >90 ?C 5 min tissue: lysed and disrupted in 1% triton and then laemmli and heated AMOUNT OF PROTEIN LOADED Over 20 ugs ELECTROPHORESIS/GEL CONDITIONS reducing 12% acrylamide TRANSFER AND BLOCKING CONDITIONS Tris-glycine plus 10% MetOH, 45 min at 400 mAmps Blocking TBST plus 5% milk SECONDARY ANTIBODY the usual HOW MANY TIMES HAVE YOU TRIED THE APPLICATION? 20 HAVE YOU RUN A "NO PRIMARY" CONTROL? No DO YOU OBTAIN THE SAME RESULTS EVERY TIME? Yes ADDITIONAL NOTES Please reply ASAP. Thanks.